Charles Frazier. Nightwoods. New York: Random House, 2011. When Luce is appointed guardian for her dead sister Lilly’s young twins, her reclusive life in the back woods of a small mountain town changes forever. Frank and Dolores are not like other children. Witnesses to their mother’s murder at the hands of her abusive boyfriend Bud, their short past holds trauma and darkness that few will ever experience. But Luce has, and while she will never be able to shower them with expressions of motherly love, she comes to understand them better than anyone else ever could. When they kill her roosters, light various items on fire, and refuse to speak, she teaches instead of punishing. By taking them on long rambles in the foothills, Luce endeavors to instill in the twins the great healing interacting with the natural world has provided her. She doesn’t use force or lecture them, just allowing the simple lessons of observation and wonder to sink in. Bud is an unsuccessful, small-time criminal, embarrassed that he has to rely on his girlfriend Lilly for support. When he unexpectedly successfully steals ten thousand dollars, the situation only gets worse: Lilly hides his money before he can drink it all away. Incensed, Bud’s behavior becomes more and more violent, until one day Lilly catches him in a monstrous act involving her twin children. She tries to kill him on the spot, but Bud murders her instead. Since the only witnesses were her kids, whom Bud is convinced are retarded since they refuse to speak, shaking the charges is a snap. The real problem is that he never found out where Lilly hid his money, but a sudden brainstorm convinces him that it must be with those kids and their aunt, Lilly’s sister Luce. So he sets out to the mountains to get back his cash, and to ensure that no one will ever be able to accuse him of Lilly’s murder. Frazier’s third novel is a linguistic feast, combining a suspenseful plot and deep insight into the nature of love, revenge, and survival. It becomes apparent that the land, particularly the forest, is a character in this tale just as much as the men and women are, and its all-encompassing presence fills this satisfying read to the brim. Nightwoods was the winner of the 2012 Sir Walter Raleigh Award. Charles Frazier. Thirteen Moons. New York: Random House, 2006. Loosely based on the life of frontiersman William Holland Thomas, narrator Will Cooper provides a detailed picture of life in western North Carolina in the early nineteenth-century. After working as a “bound boy” at a “trade post at the edge of the Nation,” Will is adopted by a Cherokee elder, Bear. Will eventually leads the clan as a white Indian chief and then as a Colonel for the Confederacy. Still haunted by the memory of his one true love, Claire, Will escapes solitude through his travels. 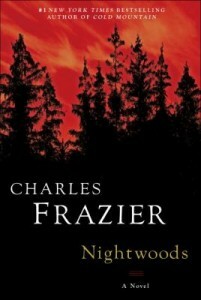 Charles Frazier. Cold Mountain. New York: Atlantic Monthly Press, 1997. Cold Mountain is the story of Inman, a deserter from the Confederate Army, and his long journey home to the mountains of North Carolina during the last year of the Civil War. The novel alternates between Inman’s struggles and those of Ada, who is at home near Cold Mountain and is able to get by only with the help of Ruby, a mountain woman unafraid to fend for herself. Cold Mountain, winner of the National Book Award in 1997, has been praised for its accuracy in portraying geographical and horticultural details, as well as the particulars of nineteenth-century life in the North Carolina mountains. The book also inspired the 2003 Oscar-winning film of the same name. Cold Mountain won the 1997 Sir Walter Raleigh Award for Fiction.